Suzanne is a professional business consultant and coach (PCC). Suzanne offers tailor-made individual and organisational development plans that support the implementation of change and strategy processes to optimise the organisational performance. She supports her clients by releasing and developing their core competencies and leadership skills to reach higher levels of performance, productivity, and profitability. Suzanne has 10+ years of experience as a strategic development partner and business coach in private and public companies. She specialises in leadership and team development as well as stress and conflict management. Suzanne has a former career within health and working environment safety in the healthcare sector, and she is also a trained teacher. The company NJKI (Nordjysk Kodeindustri, i.e. North Jutland Code Industry) is owned and run by programmer and software integrator Morten Lassen, who started developing software professionally in 1997. After several years of private employment, working with various standard software products, Morten realised that many companies paid far too much for solutions that did not match their needs exactly. Consequently, Morten founded NJKI in 2008, jointly with a former employer. The motto of NJKI was - and remains - to develop software that develops businesses. Today, NJKI is still run by Morten Lassen, who is dedicated to both development and support. 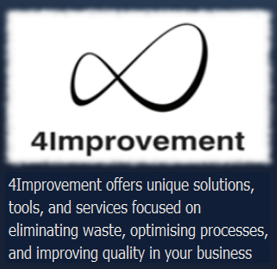 In addition to being involved in designing and developing 4Improvement standard tools, Morten also provides assistance with systems integration, upgrading existing software, and developing tailor-made software solutions for various types of companies. Jakob holds a B.Sc. in mechanical engineering, but soon after his graduation in 1987 he started gravitating towards IT-related assignments. Since the early 1990s, Jakob has held various positions within quality management, system administration, IT operations, SRM, sales, and support. Besides his pronounced analytical and tactical skills, Jakob has over three decades of experience with Danish and English business language, and he is a seasoned technical and commercial communicator. Jakob is also a certified IPMA project manager who thrives in complementary work environments where everybody contributes to achieving common goals.